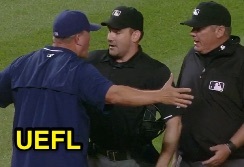 HP Umpire David Rackley ejected Padres Interim Manager Pat Murphy for arguing a prior inning's foul ball call (USC-DiMuro) in the top of the 7th inning of the Padres-Nationals game. In the preceding bottom of the 6th inning with two out and one on, Nationals batter Bryce Harper hit a 2-1 sinker from Padres pitcher Marc Rzepczynski on the ground to first base, the ball ruled foul by Rackley for having struck Harper's lower leg while he was in the batter's box. Replays indicate that the batted ball did not appear to make contact with Harper's leg and that Murphy visited Rackley to discuss the call when it occurred in the 6th inning before being ejected arguing the call in the 7th (Repeat Visit - DiMuro Rule), the call was irrecusable. At the time of the ejection, the Nationals were leading, 8-3. The Nationals ultimately won the contest, 8-3. This is David Rackley (86)'s third ejection of 2015. David Rackley now has 5 points in the UEFL Standings (3 Previous + 2 MLB + 0 Irrecusable Call = 5). Crew Chief Hunter Wendelstedt now has 9 points in Crew Division (8 Prev + 1 Irrecusable Call = 9). This is the 180th ejection of the 2015 MLB Regular Season. This is the 86th Manager ejection of 2015. This is the Padres' 15th ejection of 2015, 1st in the NL West (SD 15; LAD 8; SF 5; COL 4; ARI 3). This is Pat Murphy's first ejection since August 16, 2015 (Dan Iassogna; QOC = Y-C [Balk No-Call]). This is David Rackley's first ejection since August 7, 2015 (Dan Jennings; QOC = Y-C [Check Swing]).